Blondie and Brownie: File Under "You Need This in Your Life....NOW"
Man, oh man. Graham cracker soft serve. Where have you been all my life? That perfect combination of sweet and salty. And what could make Graham Cracker soft serve even better? Um, how about charred marshmallows and hot fudge? I noticed that they had both options in their toppings bar and visions of a s'more sundae danced in my head. 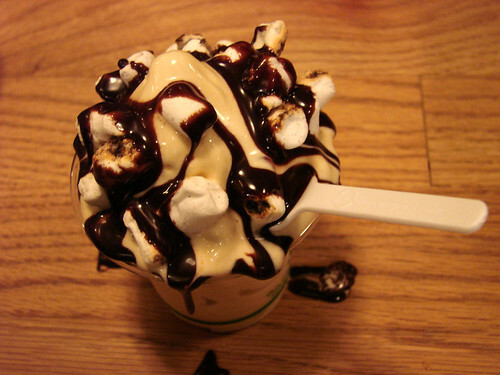 A little cup of charred marshmallow will run you 50 cents and a more than ample shot of hot fudge will set you back $1. All together my make my own sundae cost $5.50 plus tax. Not terrible and since they give you the toppings on the side you control the ratio. There was plenty of hot fudge left over, definitely enough that you could split one side of hot fudge for a couple people's cups of soft serve if you happen to go with a group. Graham cracker soft serve, I salute you! omg that looks so good! And to think I was there the other night and only had the banana green curry bread. SO going there ASAP for this, graham cracker sounded delightful. I'm going to try it too. It's been on my list since I saw Kathy YL Chan's review at Serious Eats. I've only been putting it off because I had a (brief) love affair with the pistachio salted caramel flavor. I feel that David Chang is messing with my emotions (and taste buds)! HOLY CRAP that looks good. Why did I ever move away from NYC? I need to visit this place soon! omg I need this in my life.